Mugello Circuit, 2016: A race that began with clouds of yellow smoke from the crowd ended for Rossi when his M1 went up in smoke on lap #8. 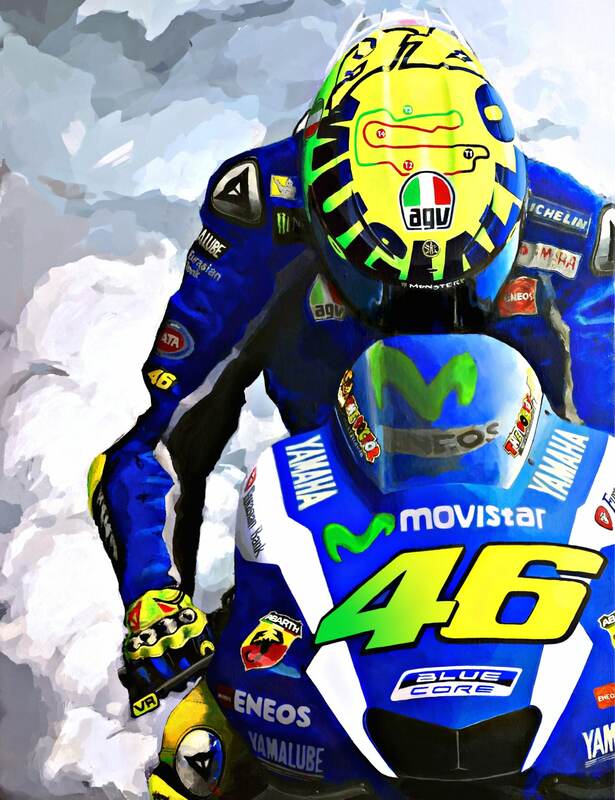 The crowd went silent and, as smoke billowed from his exhaust, Valentino Rossi bowed his head in defeat as he rolled to a stop. 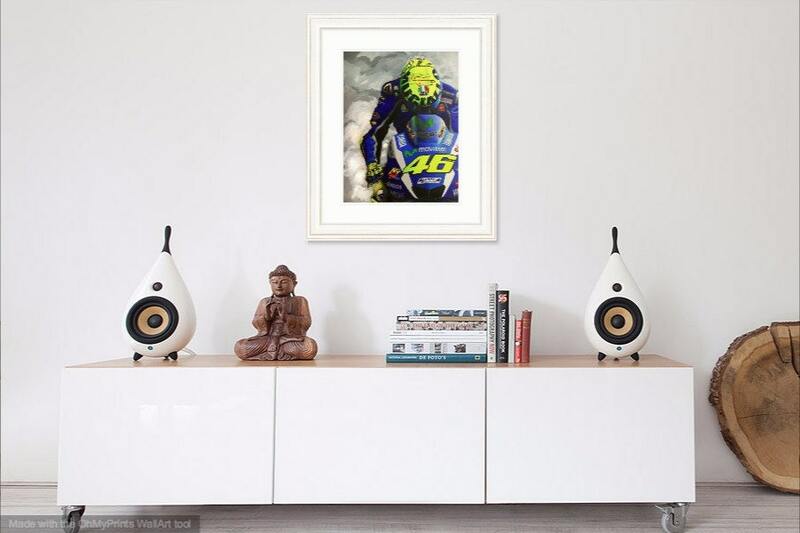 In his 2016 MotoGP series of paintings, the artist seeks to capture the essence of each race in with a single image. Though most races are remembered for victories, Mugello in 2016 will go down as one of the most disappointing disasters of the season for Rossi and his fans. The original Acrylic-on-Canvas painting measures 24"x18". 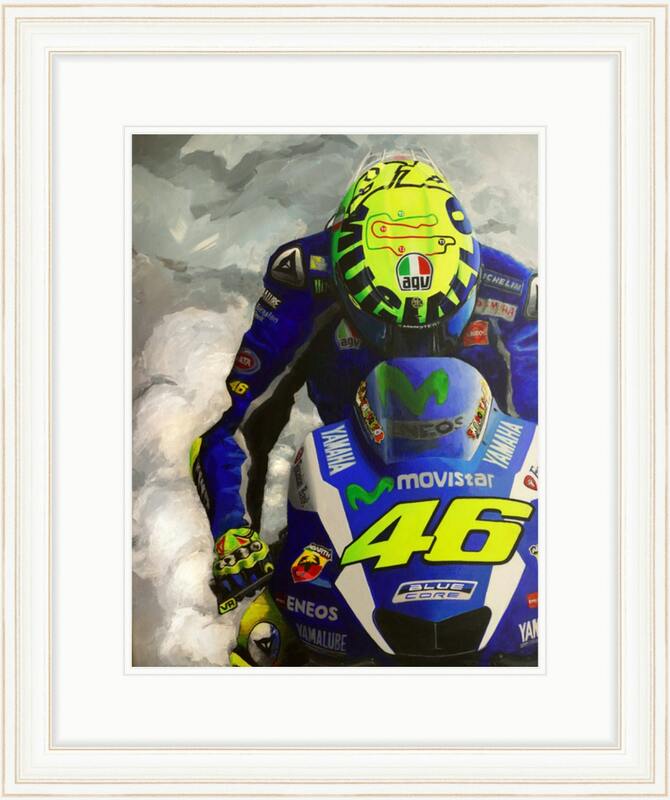 Prints of the original Acrylic-on-Canvas painting are available as banners, on canvas or on premier heavyweight paper. Each hand-signed Giclee print is individually printed by the artist on Epson Canvas utilizing professional imaging technologies and methods. The meticulous reproduction process and the use of archival pigments and museum-quality canvas (estimated to last 400+ years) produces a stunning print frequently mistaken for an original. Signed poster prints are printed on Kodak Professional Endura Premier paper for exceptionally sharp and precise colors, bold, rich blacks and clean, crisp whites. Poster prints will last 100 years in a typical home display and 200 years in dark storage. Flexible vinyl banners are fade-resistant, tear-resistant and are built to withstand variable weather conditions (which should make them perfect for any garage). Additional processing time may apply. Artwork will arrive rolled in a durable shipping cylinder or shipped flat depending on size. Most prints are ready to ship, but larger sizes may require additional processing time.